It’s quite natural in our mash-up-loving culture to want to put two things together that we love and make it a “thing”: Cheese on hamburgers. Breakfast and lunch. Croissants and doughnuts. Some of these creations are so good that they have become a regular part of our food culture—it’s hard to imagine a world without cheeseburgers and brunch; but others, like Cronuts, we could probably do without. There’s a name for the blending of two words together: portmanteau, coined by Lewis Caroll in 1871. Food-related portmanteaus are words we generally use for hybrid fruits (tangelos or plumcots, for example) or invented dishes, like commercial products that don’t have a particularly long history or a culinary tradition. Take the frappuccino, something between a frozen frappe and a cappuccino. They aren’t named romantically—like cappucinos (literally “little hoods”), which got their title from the color of the brown- and white-hooded monks’ robes—and you won’t find them in Italy. They’re a recently-invented beverage, trademarked by Starbucks, no less. But portmanteaus do exist in Italian, too—even in the kitchen. Farrotto comes from the combination of farro and risotto—in other words, it’s a risotto-style dish made with farro. The technique is known as risottato, which is rather like saying “risotto-ed” in English, and you can find pasta risottata (pasta cooked in the style of risotto) and orzo risottato (barley cooked in the style of risotto), which more and more, you’ll see named as orzotto. You can even find quinotto (that’s right, made with quinoa). And at Enoteca Pinchiorri, one of Florence’s most important restaurants, they do a “spagherotto“—broken (“rotto“) spaghetti cooked like a risotto. Farrotto works the exact same way as risotto. Exchange the usual white rice with pearled or semi-pearled farro and pick a few favorite, seasonal ingredients. If you want to add something meaty, go for something that will give some bang for its buck: finely chopped pancetta, salted anchovies, or pork sausages, casings removed and meat crumbled. Prepare a chicken or vegetable stock and get out some white wine, too. Toss, stir, and watch the liquid emulsify, topping up with more liquid until the farro is cooked. A generous grating of Parmesan or pecorino goes far in terms of flavor and creaminess. 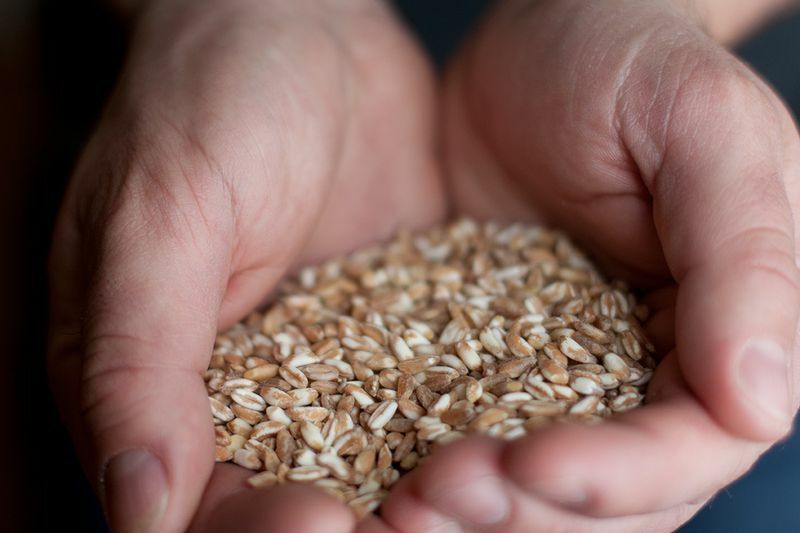 With farrotto comes the health benefits of a nutritious grain, but also advantages in texture. 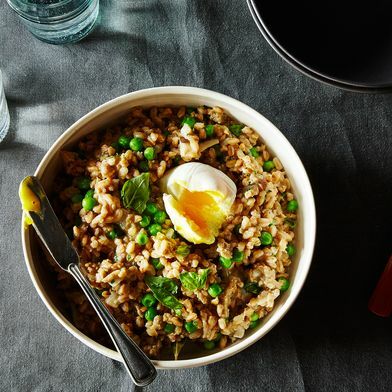 Those who love al dente (and who tend to go too far with their rice in traditional risotto) will appreciate the bite that farro retains, even when well-cooked. 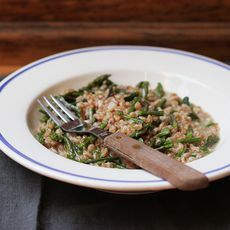 And farro’s nutty, earthy character lends another level of flavor to the dish and makes it especially good when paired with vegetables like wild asparagus, bitter greens, or mushrooms. In English, farro is a confusing ingredient as there are several different varieties and sizes. 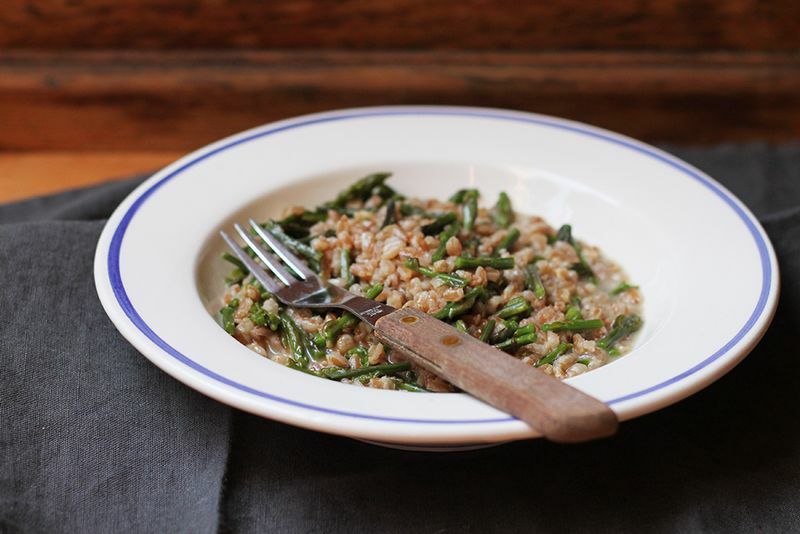 Look for Italian farro—Tuscany is a particularly important producer. And try to get farro that is semi-pearled or pearled. 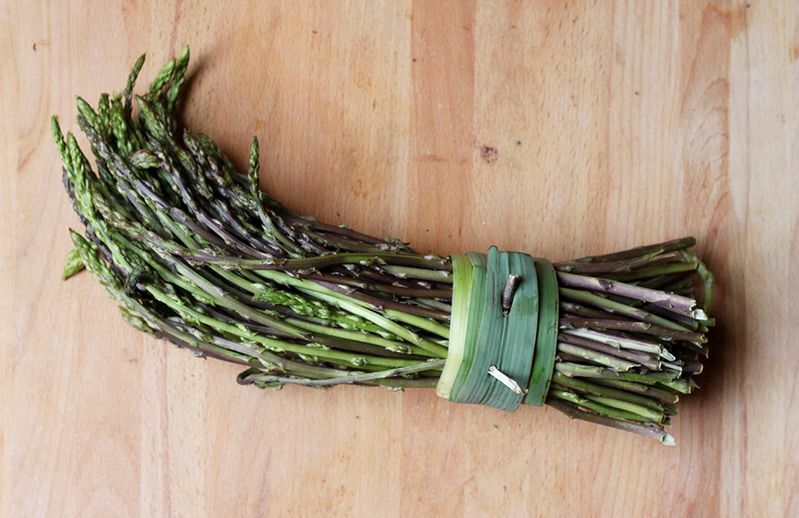 This means that the husk is partially or full removed, and it reduces the cooking time greatly. 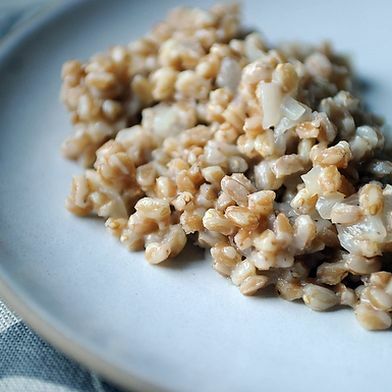 Pearled farro does not require soaking before use and cooks the most quickly; if you have semi-pearled farro, soak it overnight to reduce the cooking time (otherwise, it may take up to 40 minutes). Either way, it’s best to follow the recommendations on the packet you end up with in order to estimate the time it will need to cook and whether soaking is recommended. The other thing to note with this dish is that, seeing as it’s not a particularly traditional preparation, you can be free to experiment and combine flavors. This is lovely with a bit of freshly grated lemon zest or some mint (or even better, calamint) leaves, both of which give an uplifting zing to the whole dish. If you want, some finely chopped pancetta, sautéed separately until the fat is rendered and the meat is crisp, goes very well, too.